CHAD PLAUCHE-ADKINS The Marietta Times Roger Patterson and Nancy Mendicino look for the items they want to bid on at the 19th annual Callihan Auction on Friday. Roger Patterson and Nancy Mendicino look for the items they want to bid on at the 19th annual Callihan Auction on Friday. •Amount raised at 2018 auction: $29,000. •Number of items up for auction: 122. •Number of Callihan Auctions: 19. •Number of homes built by Habitat for Humanity of the Mid-Ohio Valley since 1990: 100. On Friday evening, 260 caring residents of the Mid-Ohio Valley gathered at the Marietta Shrine Club to raise funds for the Habitat for Humanity of the Mid-Ohio Valley. According to their website, since 1990, the organization has built adequate housing for more than 100 deserving families in the area. The families still have to pay for most of the materials for their home, but labor and some of the other costs are donated to drive down the amount of their monthly mortgage payment. 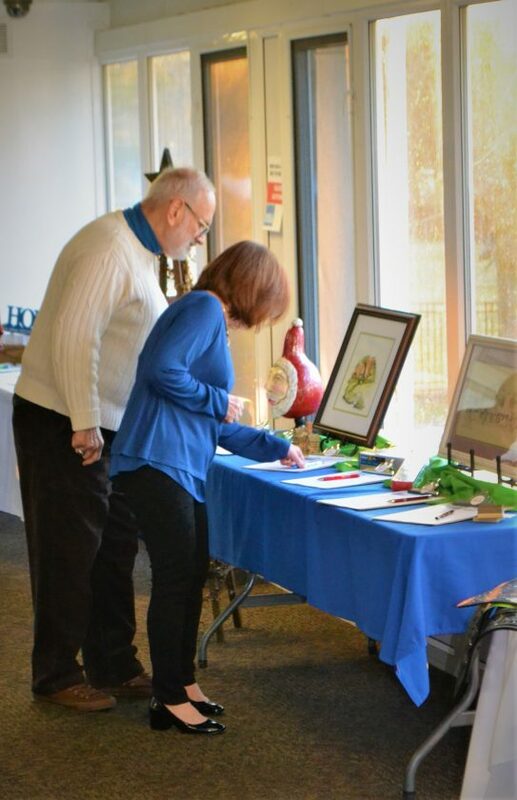 The organization’s 19th annual Callihan Auction had dinner, drinks and both a silent and regular auction with more than120 items available to the highest bidder. Some of the items included construction needs like gravel and fixtures to home decor items, gift certificates and tickets to local events. A unique auction item was five signed books and a half hour speaking engagement from Army veteran and former POW, Jessica Lynch, who attended the event. Lynch, who is now a substitute teacher in Wood and Wirt counties in West Virginia, said there is a simple explanation as to why she donated her time to the auction. Using the internet to promote the event went so well, Collins said they were planning on having an online auction to coincide with the 20th annual Callihan Auction.